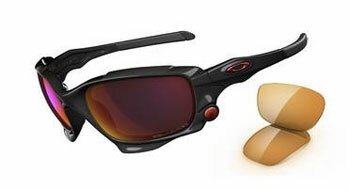 Oakley‘s new Jawbone frames sport a clever new lens-changing system. Unlike the popular Flak Jackets, which allow interchangeable lenses but only with a lot of nerve-wracking bending of both frame and lens, the new Jawbones have a hinged system that opens rather like origami. First you unlock the frame by flipping up the nose pad, then the entire bottom half of the lens rim hinges open. Interchanging lenses is a snap, even in the field. This makes swapping to a low-light set of shades a lot more plausible on the deck of a flats boat. A new net company made its debut at the show this year: Blue Ribbon Nets. Both of Blue Ribbon’s craftsmen were present and seemed like genuinely nice people who made a fine-looking product. We particularly liked the Guide Boat net, $165, a 52-inch long bad boy with a huge hoop and a tough rubber bag. In headwear/neckwear, Buff once again proves that it’s The Little Engine That Could; no company inspired more head-scratching when it first came along, and yet now Buff use (especially in saltwater) is darn near universal. Buff has continued to build on their base success with new patterns of Original Buff, including a “Catch & Release” model, some proceeds from which go to charity. Meanwhile, Buff’s engineers are at work on a new sun glove (and a separate bluewater fish fighting glove) for 2011. The prototypes looked very promising. C&F Design will be facing some stiff competition from outright copycats this year, but they’re doing their best to stay one step ahead. One promising new box series sported clear lids, so you can see the flies contained inside (of course, this means you can only put flies on one panel, so they’re most appropriate for larger patterns for, say, tarpon). Angling Evolutions has made a name for itself with its innovative Fish Pimp indicator technology. Now they’ve addressed a common problem faced by anyone who has ever used powdered fly float on a windy day: how do you keep it all from blowing away? The new Shake-N-Float system is a little like a fly tier’s bead dispenser: on one side, you have a chamber to put the fly in, which is separate from the desiccant powder. Simply flip, shake, then flip back over before opening, to keep all that powder from flying away. 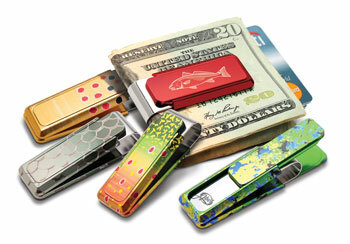 Abel Reels partnered with M-Clip this year to release a line of fish-patterned money clips. The M-Clip patterned money clips aren’t cheap, but then you wouldn’t expect such a unique product made at a such a high level of craftsmanship to be given away. We’re hoping beyond hope that someone will buy us the cutthroat-patterned clip for Christmas. Meanwhile, Smith Optics released a new lineup ofcastor plant-derived sunglasses. The Evolve lineup are slightly more expensive, but the manufacturer assures us that they are greener than any other line of shades on the market. Finally, the Yeti Cooler represents a class of product everyone who has ever owned a boat should be aware of. These super-rugged coolers are made of dense plastic (and in some cases fiberglass). They will keep ice for days, have non-slip tops, and come with their own hardware to be secured to decks. They are also very fly-line friendly, with recessed rubber T-bone latches. As a result, they do double duty as either a poling or casting platform. Gheenoe and other microskiff anglers along the coastal U.S. have been using this style of cooler for years now.